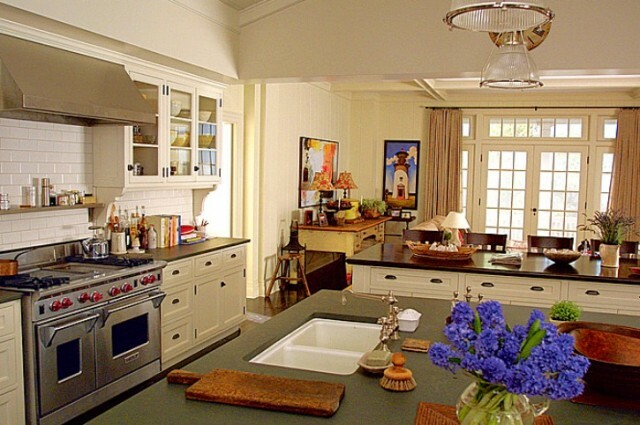 If any of you saw Something’s Gotta Give, then you might remember the kitchen above, which was, quite possibly, more popular than the movie itself. But after almost a decade (!!! 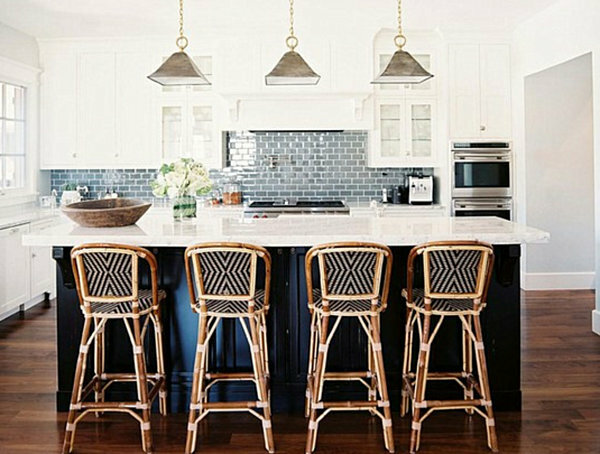 ), it seems like the tides are shifting from black to white countertops. You may have noticed that there’s plenty of Carrera and Calacatta (which has more dramatic veining) marble in my inspiration photos. 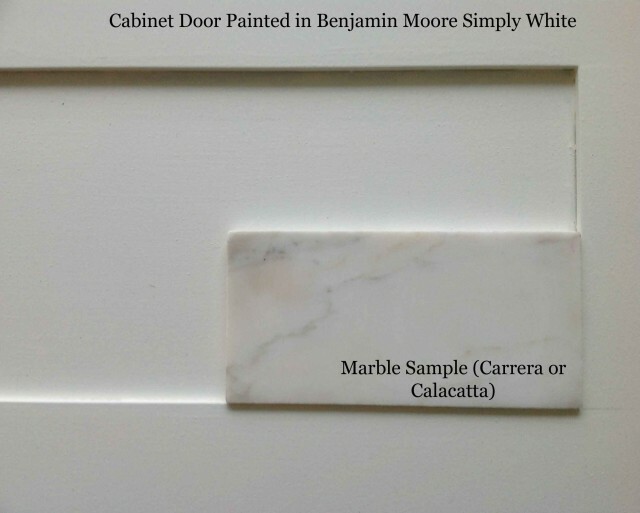 I considered getting Carrera or Calacatta counters for, oh, about five minutes or so… just about the amount of time it took for this little sample I bought home (below) to get some major etching and staining from a little test I did. You can see the discolorations in the marble sample below. By contrast, the quartz samples completely resisted staining, even after I left spills on them for more than 24 hours. 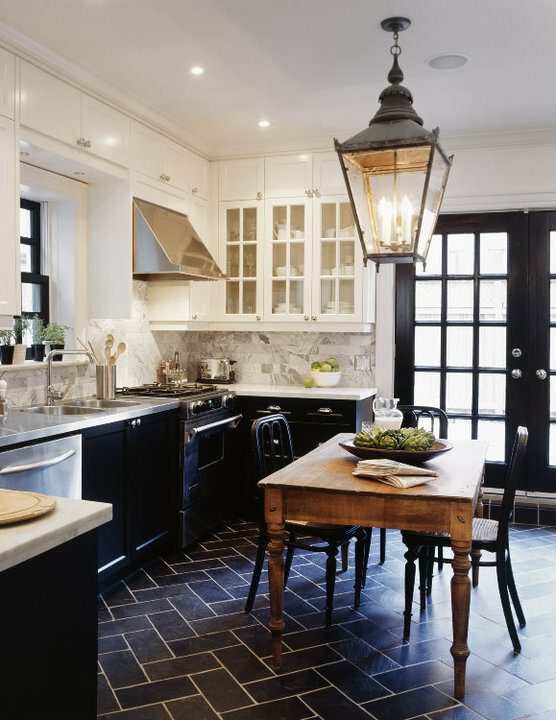 Marble might be a great choice for some people (those who like patina, those who don’t actually cook in their kitchens, etc. ), but I don’t want to worry about guests accidentally spilling wine or tomato sauce on my kitchen counters. 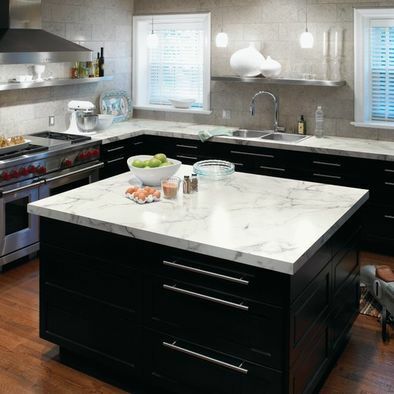 While not necessarily any cheaper than the real thing, quartz has recently become a popular alternative to marble. And just as you’ll find lots of variation in marble, which you can see in the pastry slabs above, there’s plenty of variety in quartz as well. 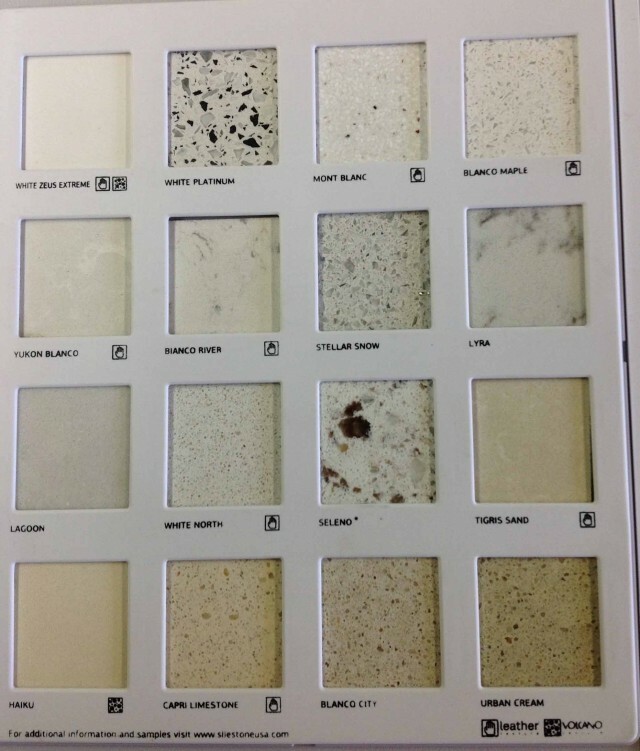 Below are some of the light colors available from Silestone, one of the most popular quartz manufacturers. 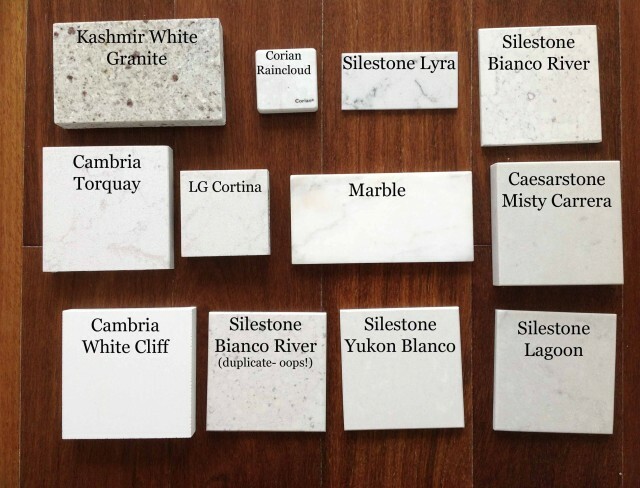 Silestone is one of the only major quartz brands that sells out of a big box store- Home Depot. 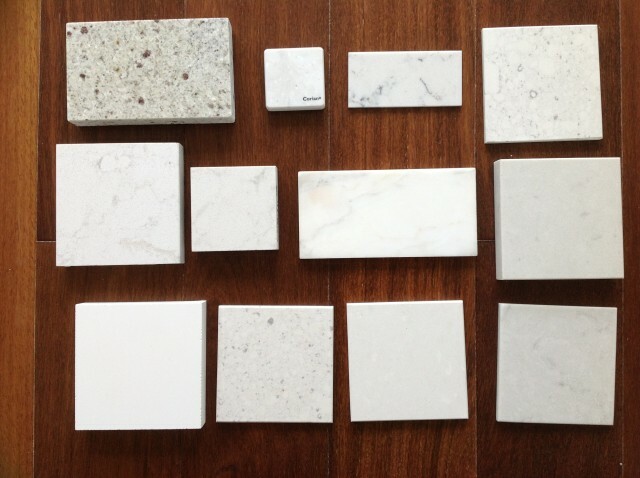 I gathered as many light-colored and marble-look quartz samples that I could find and then threw in some Kashmir White granite and Corian Raincloud for good measure. Here’s the round-up. I wasn’t a fan of the busy pattern on the granite and the Corian felt to plasticky to me. 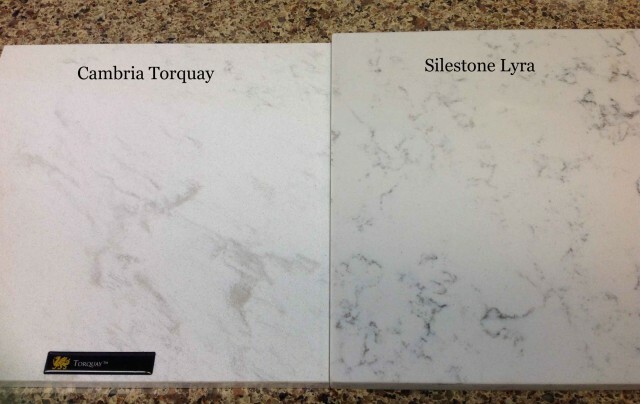 And although they look nice in these small sample sizes, I wasn’t a fan of the Silestone Bianco River or Silestone Lyra on the larger samples that I saw in various showrooms. I threw the White Cliff out of the running because I don’t want a pure white… I’d rather a little texture to keep things interesting. So that left me with Silestone Yukon Blanco, Silestone Lagoon, Caesarstone Misty Carrera, Cambria Torquay, and LG Hausys Viatera Cortina. 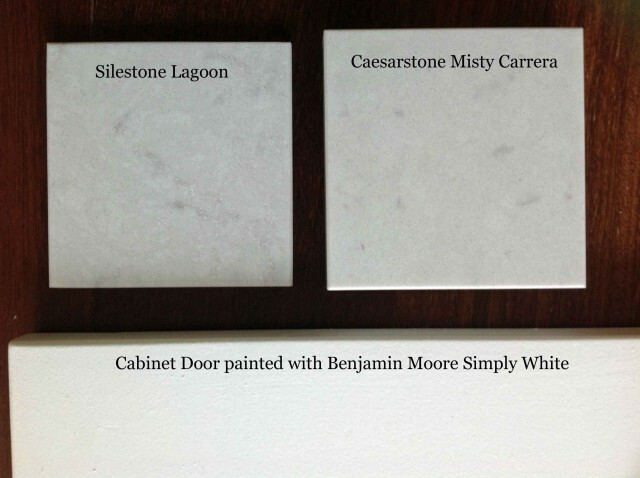 As I mentioned in my last kitchen renovation post, the Silestone Lagoon and the Caesarstone Misty Carrera are very similar. From afar they definitely read as grey. 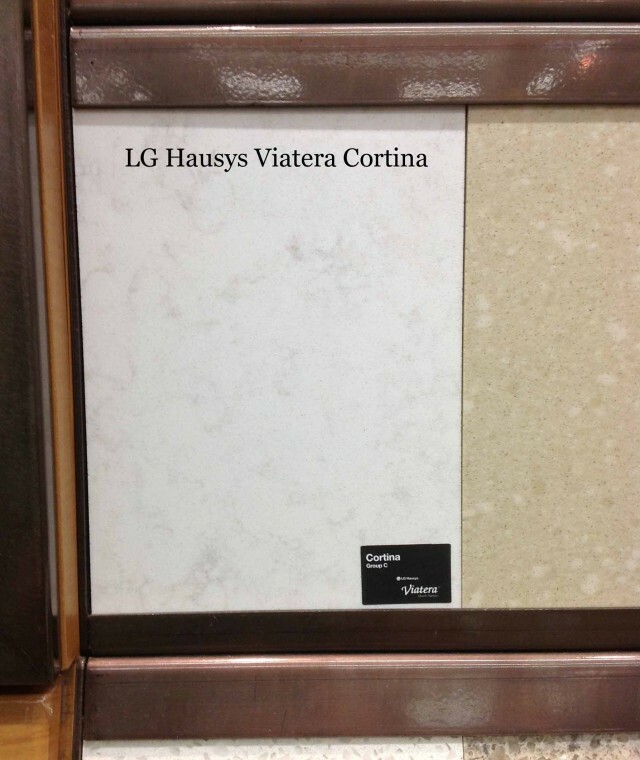 And the LG Hausys Viatera in Cortina seems like it’s a pretty good match for the Cambria Torquay. They’re both creamy whites with grey and taupe swirls/veining. 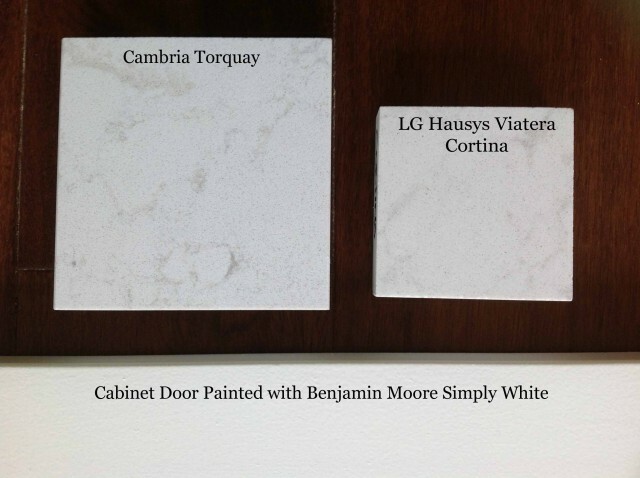 Here are some photos of the large samples at a showroom that I visited. In my mind the Torquay looks much more natural while the Bianco River almost has a snow leopard print feel to it. 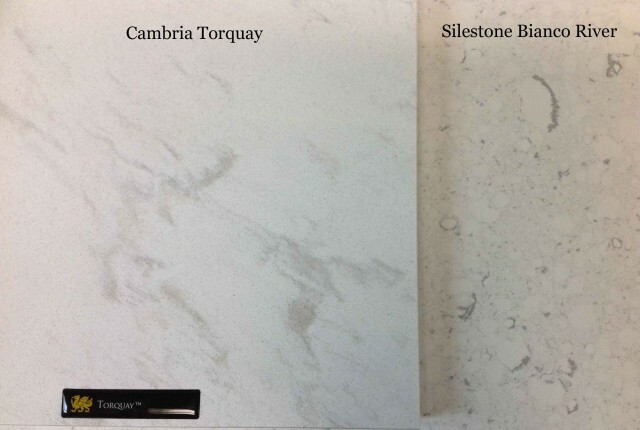 Here’s that same sample of Cambria Torquay next to a sample of Silestone Lyra. You can see that the Lyra definitely has a squiggly quality to it. 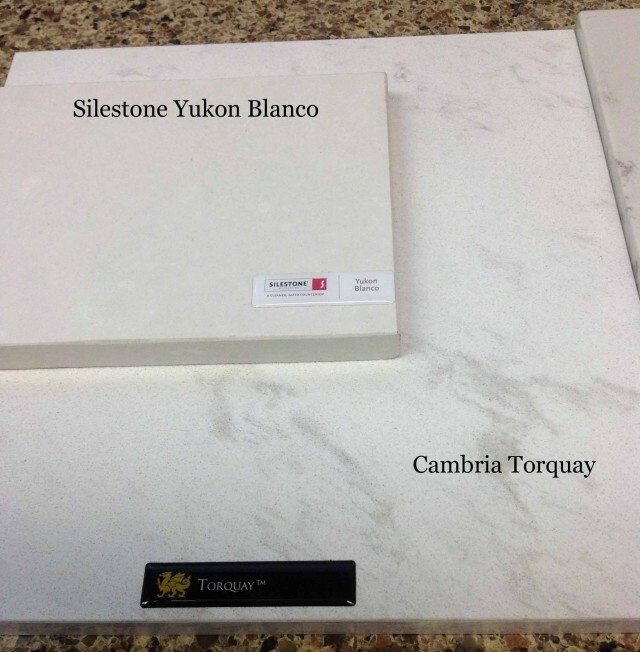 And there’s that Cambria Torquay sample one more time next to the Silestone Yukon Blanco. The Yukon Blanco is a greige/grey that has a slight variation and texture to it… you might be able to see some subtle creamy white swirls. 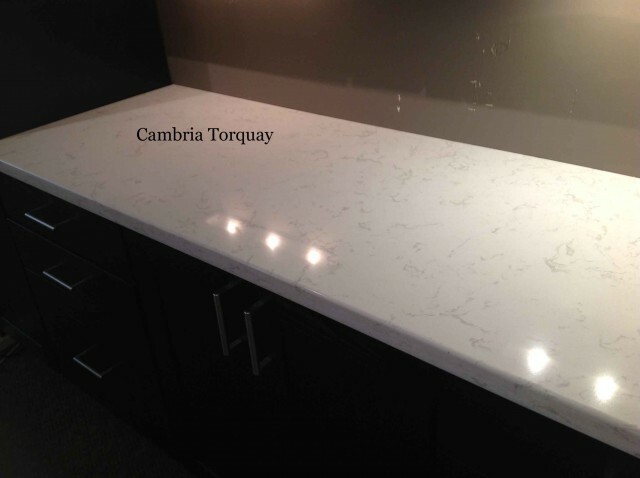 It reads much more neutral or warm than Carrera marble, which typically has very cool grey tones. 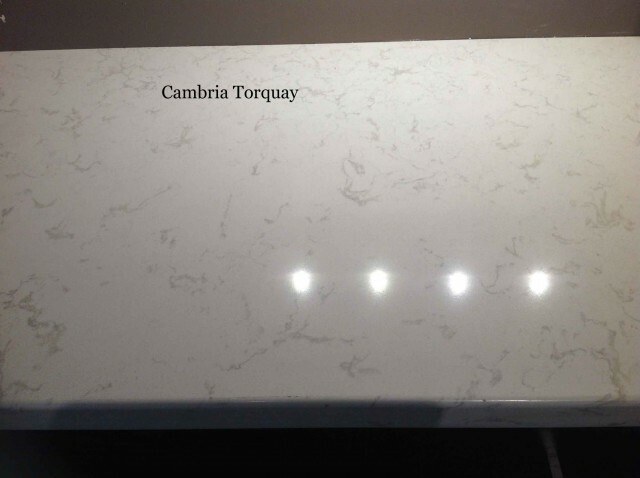 Most of the photos that I’ve seen of Cambria Torquay online have been in bright, natural light, which always made the veining seem very subtle. This harsh, indoor lighting inside the Homeowner’s Design Center really seems to make the swirling/veining more pronounced. Update: After I posted this, a couple new marble-like options came on the market. 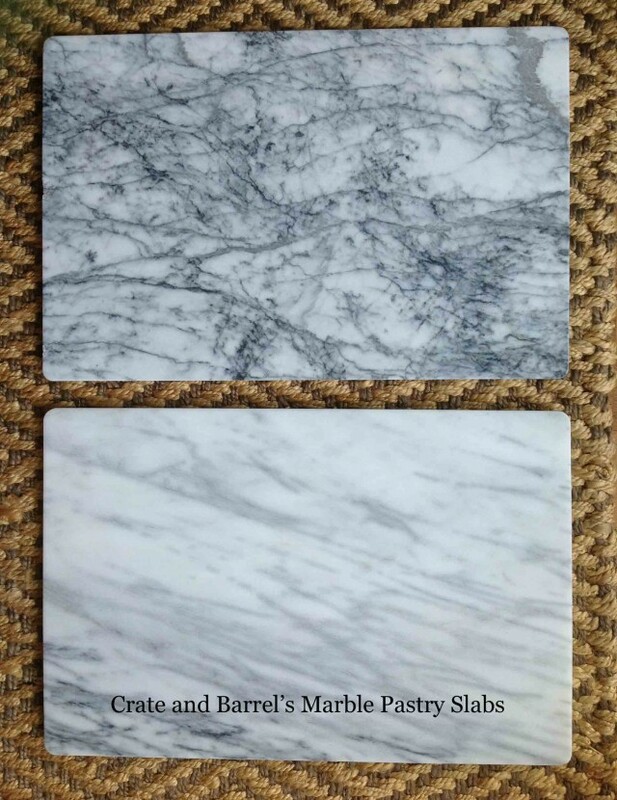 My newer post, White Marble Alternatives for Kitchen Counters: Part Two, includes photos of those products.